During ICE Atlanta, Anna and I joked that we should have a booth that was pizza-themed. We'd call it "pizza stuff," and we'd feature pizza artwork, pizza patches, pizza jewelry, and..well, you get the idea. I didn't create any pizza art for this gift guide today, but I think I've gathered some fun ideas for the pizza-obsessed person in your life. I'm not going to lie. I may have to buy this one for myself. Living the life of a spinster, depending on the day, either Pizza or Ice Cream is my Bae. 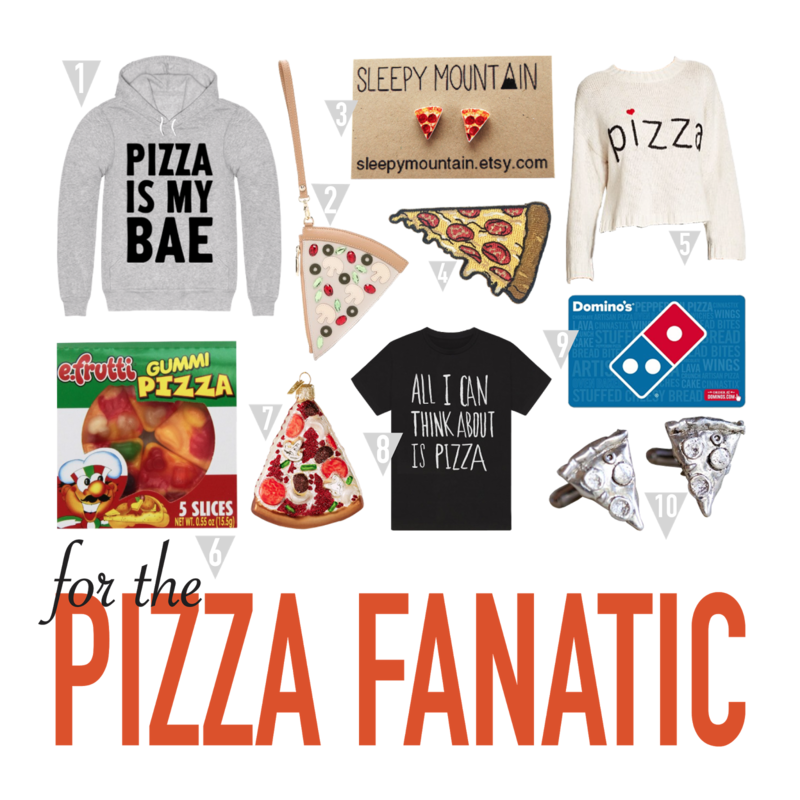 For the sake of a hoodie, I'll go with Pizza long term. This is for the pizza fan who likes to get fancy with their pizza love. This is a pretty nice handbag, and some of the pizza toppings are actually rhinestones. Perfect and a little cheeky. The perfect way to show your pizza love every day of the week. If your ears aren't pierced, well, I think these are worth a piercing. This shop has a lot of really fun studs. I suggest you peruse their stock. Patches are a thing this year. They're great for backpacks, totes, jean jackets, and I've even seen some celebrities with patch-adorned leather jackets. At $4 this makes a perfect little stocking stuffer. I love how this looks home made, and it gets straight to the pint. Pizza. Enough said. So, this doesn't taste like pizza, but this is yet another stocking stuffer idea. At $13.29 for a pack of 48, you're paying around twenty-eight cents per pack. You can stuff all the stockings in your neighborhood without thinking twice. I love this. This is a great friend gift, especially if you and your friends exchange gifts before christmas. this will give them time to enjoy it on the branches of their Christmas tree before hanging it else where for the rest of the year. Because...really, is this just for Christmas? I didn't think so. Some days, this is just the truth. You know, most days this is the truth. This is a last minute gift that is totally acceptable. Run into the drugstore or Target or wherever and pick up a pizza gift card. Unless your friend is a pizza snob...and if they are, maybe you should reevaluate your friendship. The best pizza is the pizza that's available. In this case, it's the pizza that's a gift. These are fun for a younger brother or a college guy. That is, if they have french cuff shirts. If they don't have french cuff shirts, they should...because it gives you a built-in gift you can give them. So...maybe give them a french cuff shirt, too. Ok, now grab yourself a slice of pizza and get to shopping. It's Cyber monday, spinsters! Seize the deals!